Tom Crean received a verbal commitment from Blair Academy's Patrick Hazel today. 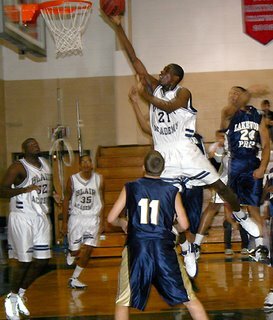 The commitment from the 6'7" 220lb power forward completes the 2007 recruiting class for Marquette. IWB of MarquetteHoops.com along with FOXSports.com and Scout are all reporting the verbal was given today. Joe Mantegna, head coach at Blair Academy, is no stranger to talent as he has coached Charlie Villanueva and Loul Deng at Blair Academy in the past. Last year's Blair squad had Shamari Spears and Wellington Smith who are attending Boston College and West Virginia respectively. Per Scout.com last year, "the one guy that really has coach Joe Mantegna excited is 6-foot-7, 220-pound junior power forward Patrick Hazel out of Bayside High in Queens, N.Y."
"He’s a sleeper, a poor man’s Ben Wallace," Mantegna said. "He’s active, plays hard, rebounds and blocks shots. He’s a throwback. He’s a gem." Hazel is the fourth player MU has added to its roster in the last two years from the East Coast, a sure sign that the Big East conference affiliation is paying huge dividends for Crean and his staff. Hazel will join combo guard Scott Christopherson (LaCrosse, WI) and power forward Trevor Mbakwe (Mendota Heights, MN) as part of the incoming 2007 recruiting class. Hazel was recruited by Virginia, St. John's, St. Joe's, Seton Hall, Hofstra, Rhode Island, UMass, Holy Cross and Lehigh. Here is Todd Rosiak's revealing article on Hazel's verbal. The article is laden with terrific detail about Hazel's recruitment and background -- as well as this testimonial from his high school coach. "He's going to help Marquette win because he does all the garbage that most kids don't want to do that makes you win. He's unselfish to a T, he's a team guy and he's a real uniting personality in the locker room and school. He's just a tremendous kid." Here is the Rivals article on Hazel's verbal. Here is the Scout.com article on Hazel's verbal. So what does it mean for Jerrell Williams? I believe it means Jerrell goes elsewhere. I don't think Williams was ever offered from MU and that's why he committed to LaSalle early on Saturday. He sounded like a great kid so good luck to him. I'm sure Coach Crean saw something special in Hazel to offer. Crean snatched this kid up quickly!! You know there's something about this kid that extraordinary knowing TC's incredible eye for talent. I agree that there's hope in how early he snatched him up, and especially with his past reputation of finding underrated players. I just hope that his past reputation of not finding very good big-men will be proved wrong with this recruit.